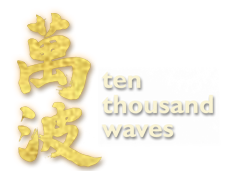 10,000 waves in Santa Fe! This spa was so worth going to. I scheduled the Shoji private bath for myself and a friend (who had to cancel at the last minute), so it ended up just me and Hmm… fabulous! I had the hot tub, sauna, and cold plunge to myself, even though I didn’t use the cold plunge since it was a cool evening already. Shoji tub is outside with a beautiful landscape of trees to meditate on while sitting in the tub. A quarter moon brightly hung in the sky for viewing. 55 minutes of pure joy. And so needed. I would have loved to get some pictures but I had late customers that night-a long drive (plus I took a wrong turn)-and by the time I arrived I was running late. Not to mention the 92-96 steps up the side of a mountain to get to the spa. I lost count on the way up. So no pictures on this post. If your ever in Santa Fe, NM look http://www.tenthousandwaves.com/ up. They also have a resort and restaurant. The restaurant is on my list to stop at next time I’m down there.